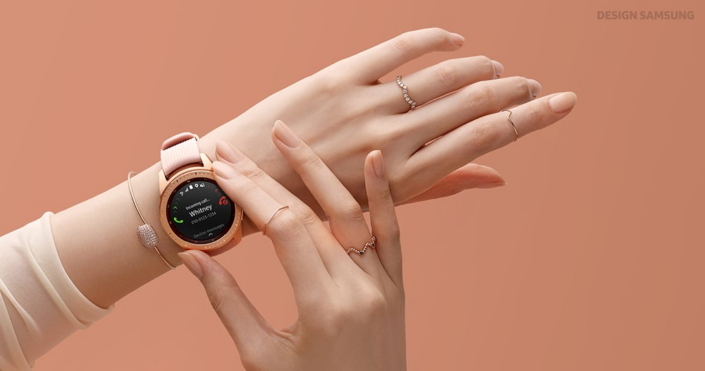 The Galaxy Watch represents the meeting of connectivity, wellness and design. Individuality, innovation, and refinement towards perfection were all key steps in its progression. At the center of this process were the endless contemplation and fierce passion of the smart watch’s design team. 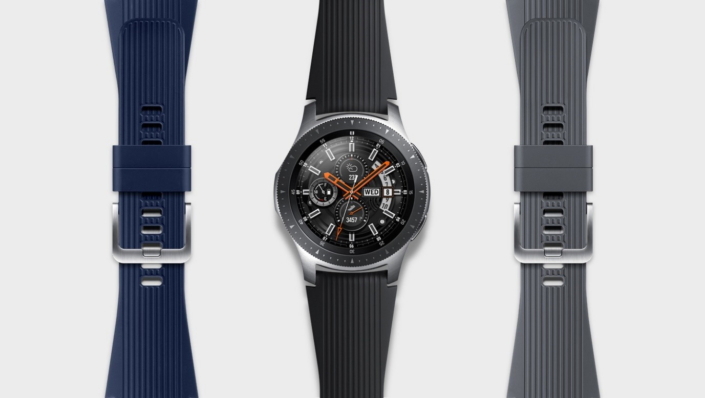 To learn more about the story behind the wearable, the Newsroom team sat down with the designers of the Galaxy Watch – Tommy Choi, Hyemin Bae, Jaehyung Hong and Sanhui Oh – as they introduced the new addition to the Galaxy family of devices. Q. The Galaxy Watch showcases a wide array of new options, with two different sizes and various colors available. How did you approach designing the new Galaxy Watch? A. The newest Galaxy Watch’s design focused on millennials, a generation that prioritizes stylishness and loves being active without bounds. Our answer to the needs of this generation was an outer design that covers a wide range of styles – from classical moods with elegance to casual moods with a dose of freedom. We also made sure to preserve the legacy of the real watch philosophy that we have held over the years to instill the watch with a complete identity. The design embodies the spirit of activeness, inspired by the remarkably sporty racing watch. The index design with the inverted triangle is one of the results of this design. The tip of the index triangle is designed to precisely align with the hands of the watch so that users can accurately tell time even in active and dynamic conditions. Q. What kinds of changes were made to its outer design? A. Whereas the previous model featured a more masculine identity with its weighty body and bold thickness, the Galaxy Watch puts focus on micro details to create a more sensitive design. This design has a tight-knit and low-cut knurling finish of the bezel to minimize malfunctions and create a natural style suitable for women as well. Q. 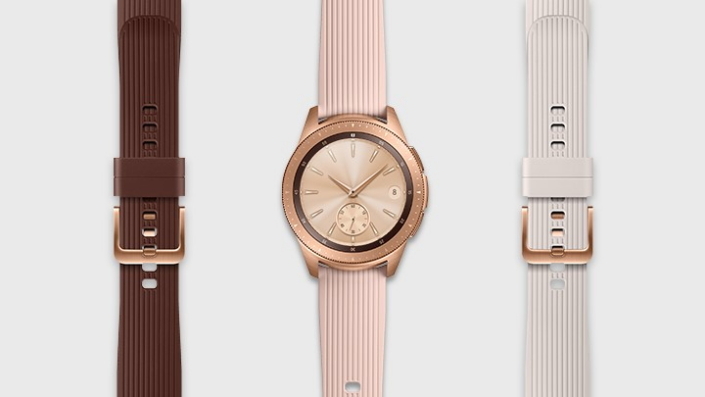 How does the strap accentuate the Galaxy Watch’s design? A. We tried to capture not only the style of the Galaxy Watch, but also the various preferences of our users with the strap. The silicon strap features a new stripe pattern design that wraps around your wrist to express a sense of speediness and activity. 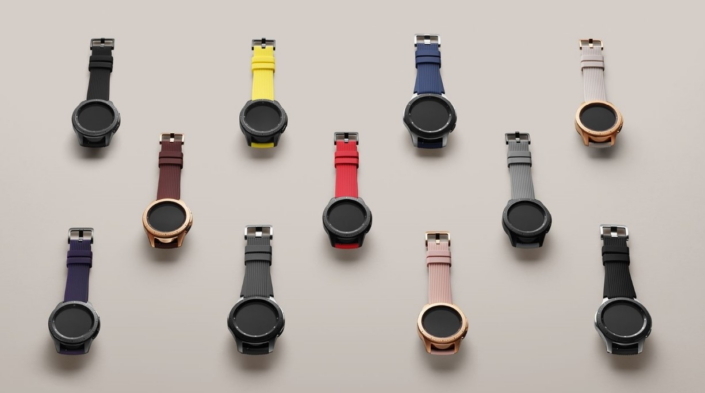 Furthermore, each product comes with straps in multiple colors, which users can mix and match with the body to give a unique makeover of the Galaxy Watch’s mood. Q. Could you elaborate further on the multiple color combinations available? A. The 46mm Silver’s Onyx Black, Deep Ocean Blue, and Basalt Gray straps bring an exquisite finish to the product’s charm. The 42mm Midnight Black comes with Onyx Black, Lunar Gray, Terracotta Red, Lime Yellow, and Cosmo Purple straps, and the 42mm Rose Gold can be paired with Pink Beige, Cloud Gray, and Natural Brown straps for users to blend different colors and express distinctive moods for every occasion. 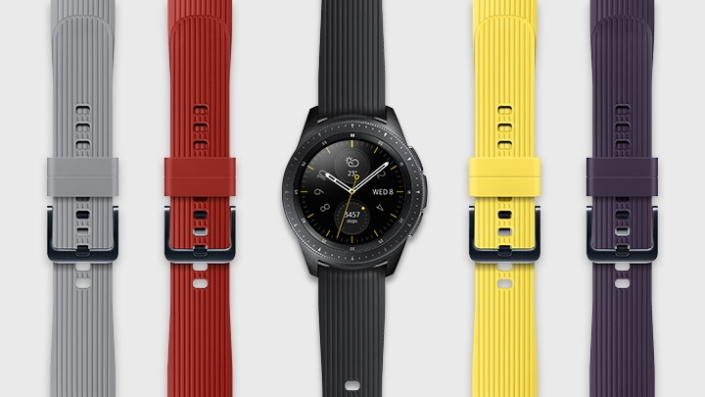 These colorful Galaxy Watch straps can be matched with the Galaxy Note9’s case as well, so users can stylize their smartphone and smart watch with a singular visual identity. Q. How did you take concerns such as battery life into consideration? A. The Galaxy Watch isn’t a device you can easily and regularly charge as you would with a smartphone, so there has always been a consumer need for a longer battery life. That’s why we put a lot of effort into the battery every time we released a new product in the series. With a 10nm (nanometer) chipset, the Galaxy Watch’s processor is smaller and consumes less power than previous models – but it is also more powerful than ever before. The Galaxy Watch 46mm model, for example, can achieve 80+ hours of battery life with typical usage1. Q. Were there any other changes to the hardware? A. The Galaxy Watch’s hardware has gone through a comprehensive transformation. The most noticeable part is the sensor located on the back of the product. We increased the number of rear sensors that touch the body to more precisely and quickly detect information regarding user conditions. On the other hand, we decreased the surface area of the sensor that touches the skin and designed it to protrude slightly to better detect user conditions, while eliminating inconveniences such as the accumulation of humidity. The Galaxy Watch goes beyond the previous capabilities of wearables and explores new functions for its users. To optimize your experience, check out these suggestions from a designer on how to make the most of the Galaxy Watch’s intuitive UX. The Galaxy Watch doesn’t just tell you the time, it helps you plan and efficiently use your time as well. My Day Watch: Your schedule for the day can be displayed based on the pertaining times on the watchface. Daily Briefing: Every morning, you can be briefed on weather and health information. At night, a summarized report of your health throughout the day and reminders for uncompleted tasks will help you efficiently manage time, with just your Galaxy Watch alone. The device pairs with the Galaxy Series so that you can easily check schedules you saved on your phone through the Galaxy Watch. Dual Time Watch: A function useful for travelers and global business professionals, this helps users check times from different time zones all at once on the watchface. When the watch detects that a user’s time zone has changed, it preemptively suggests the Dual Time Watch. 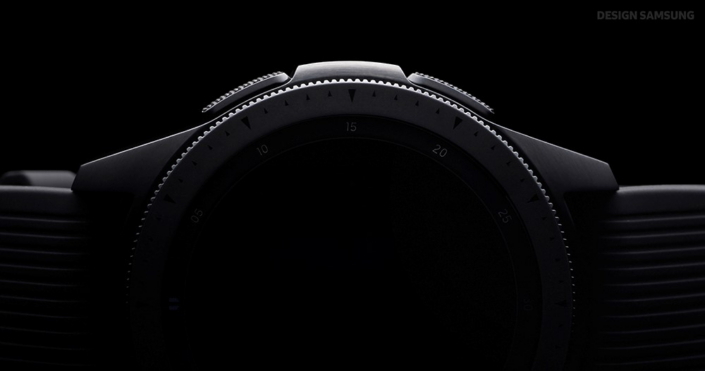 The Galaxy Watch allows users to quickly shift through different modes to accommodate different situations, which helps users wholly focus on the moment. Theater Mode: The smart watch screen is always brightly lit, which can cause inconvenience for users depending on the situation they are in. The Theater Mode prevents all elements of interruption, such as light or alarms, when users are in a theater. Goodnight Mode: Whether you’re sleeping or simply want to get some uninterrupted rest, the Goodnight Mode will make sure you’re not bothered by any alarms other than the ones you’ve set yourself. The Galaxy Watch will detect a user’s physical condition and help maintain a healthy day-to-day life. Stress Tracker: This tracker will check your stress levels and help manage it through stress-relieving breathing exercises. When using the consecutive tracking settings, you can see the real-time trends of your stress level. Sleep Tracker: Your sleep patterns are tracked automatically and analyzed into four different stages to help you organize and manage your sleep cycle better. Various Workouts: The Galaxy Watch’s fitness function now features 39 total exercises, which is a powerful upgrade from the previous selection of only 18 exercises. You can choose and edit an exercise and gradually build up your own exercise report. Back-to-back Workout: Once an exercise is over, you can designate the next exercise through a questionnaire, so that your workout routine carries on without pausing. Even if you do multiple exercises, your records will be tracked through the multiple workout report, which can help you maintain a well-organized workout routine all on your own. In the evolution of the wearable device, the Galaxy Watch now encompasses the smart lifestyle. The Galaxy Watch is the perfect complement to Millennials, never ceasing to take on the new challenges of the unknown.